A former auto repair garage in Abbotsford has been transformed by Mim Design into Au79 – a contemporary hospitality space in the guise of a sprawling indoor botanical garden – featuring a café, bakery, patisserie and coffee roaster, with a variety of event spaces both large and small. Inspired by the periodic table, the name ‘Au79’ represents gold and this element is interwoven through the owners’ business approach and in their design brief. ‘As good as gold’ was the vision, and Mim Design was invited to deliver a statement space, both architecturally and interior. “At Au79 it was important to create a contemporary functional venue filled with natural light, lush planting and soft welcoming spaces. 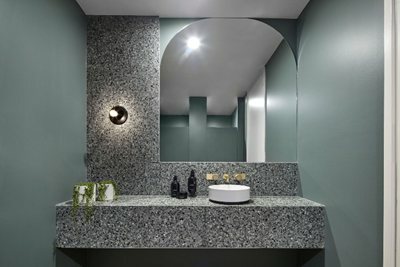 Inspiration was gathered from a variety of places from the venue’s new focus on roasting, to the curved rubber marks the old tyres made on the walls, which referenced the building, a previous car repair garage,” says Mim Design, Creative Director, Emma Mahlook. The extensive site measuring 600m2, presented a unique canvas and Mim Design’s architecture and interiors embrace its present while preserving its history. Natural finishes, authentic materials, textured surfaces, brass highlights and earthy elements were the fundamental design principles used to form a strong Melbourne hospitality identity at Au79. A hand illustrated feature wall by Mim Design artist in residence, Sammy Barry, opposite the in-house coffee roasting room, gently sketches coffee plants and foliage highlighted against a light colour palette of leafy greens and aqua blues. Four-metre high windows designed with timber lining boards showcase the original structure of the former auto repair garage and flood the café with natural light, while also providing glimpses of the neighbouring olive trees. The original garage door remains and opens out into the newly completed structure that is sympathetic to the adjacent 1950’s garage building. Lush plantings by Ben Scott Garden Design evoke vibrant and living sentiments including an impressive number of mounted Staghorns, complemented with hanging pots by Katerina Koyptina throughout. Dulux ‘Garden Grove’, was chosen because it flattered the organic, earthy tones of the coffee plant, and is complemented with pops of soft feminine blush tones in the custom made furniture, including pink tables by Billiani and banquettes designed for intimate seating. In situ cement floors, a newly added terrazzo floor, and beautifully crafted furniture, materials and joinery have been customised with brass highlights. Design and functionality come together at Au79, where space planning and adjacencies have been carefully considered to create an easy flow and divide the huge space into more intimate zones within the café all whilst still maintaining an aesthetically appealing venue, that gently references the previous life of the building. Authenticity is Gold and that’s what Au79 stands for.